Brandon Byron Jennings (born September 23, 1989) is an American professional basketball player for the New York Knicks of the National Basketball Association (NBA). After graduating from Oak Hill Academy, he decided to play professional basketball with Italian club Lottomatica Roma instead of playing collegiately for the University of Arizona, leading to controversy and debate on the NBA's "prep-to-pro" policy adopted in 2006. After a year in Italy, Jennings declared for the 2009 NBA draft and was selected 10th overall by the Milwaukee Bucks. He played his first four seasons in Milwaukee before being traded to the Detroit Pistons in 2013. Jennings spent his next three seasons in Detroit before he was traded to the Orlando Magic in 2016. Jennings was born in Compton, California to Alice Knox. He has a half brother named Terrence Phillips. His father committed suicide when he was young. Jennings attended Dominguez High School in Compton, California for his freshman and sophomore year. Before his junior year, Jennings transferred to powerhouse Oak Hill Academy in Mouth of Wilson, Virginia. In his last year of high school, Jennings averaged 35.5 points per game and set the school record for points in a season (1,312). This performance earned him some of high school basketball's most prestigious awards: the 2008 Naismith Prep Player of the Year Award, 2007–08 Gatorade Player of the Year (Virginia), 2008 Parade Magazine Player of the Year and 2008 EA Sports Player of the Year. He led his 2006–2007 team to a 41–1 record and the top ranking in the USA Today Super 25 list of high school teams. He was rated as the nation's #1 high school basketball prospect in the class of 2008 by Scout.com, the #1 prospect in the ESPNU 150, and the #4 prospect by Rivals.com. In August 2006, he chose to attend USC. On April 24, 2007, he decided instead to join the Arizona Wildcats, citing Arizona's quality academic faculty and his desire to play with Jerryd Bayless. (Bayless left after one season to enter the 2008 NBA draft.) In November 2007, SLAM Magazine's third edition of PUNKS featured Jennings on the cover along with three other top-rated high school guards (Jrue Holiday, Tyreke Evans and Lance Stephenson). In June 2008, Jennings attended the premiere of Beastie Boys' Adam Yauch's basketball movie Gunnin' For That #1 Spot at the Magic Johnson Theater in Harlem. Also attending were Kevin Love, Lance Stephenson, Brook Lopez, Robin Lopez, DJ Augustin, and Adam Yauch. The film follows eight top high school players—including Jennings—from their hometowns to New York City, for the 2006 Elite 24 at Rucker Park. In June 2008, Jennings announced that he was considering becoming the first American to skip college to play professionally in the Euroleague. The National Basketball Association requires players to be at least 19 years old and one year removed from high school before entering the league, meaning that Jennings could not enter the 2008 NBA draft. Jennings declared that his goal was to play in the NBA and that playing overseas instead of at an American college could be his best route to gain experience and make money until he was eligible to join the NBA. On July 16, 2008, Jennings signed with Lottomatica Roma of the Italian Serie A. The contract he signed with Roma was for $1.65 million net income guaranteed. After earning the contract with Lottomatica, Under Armour gave Jennings a $2 million contract to showcase their products in the Euroleague. Jennings was the first player to play for a European team rather than play for a college basketball team since the NBA's age restriction rule was implemented. In the Italian Serie A 2008–09 season, Jennings averaged in 27 games, 5.5 points, 1.6 rebounds, 2.2 assists, and 1.5 steals in 17.0 minutes per game. He shot 35.1 percent from the field and 20.7 percent from 3 point range in Serie A play. In 16 Euroleague games, Jennings averaged 7.6 points, 1.6 rebounds, 1.6 assists, and 1.2 steals in 19.6 minutes per game. In the Euroleague he shot 38.7 percent from the field and 26.8 percent from 3 point range. Jennings was selected tenth overall by the Milwaukee Bucks in the 2009 NBA draft. He became the first player who skipped college to play professional basketball in Europe to be drafted by an NBA team. Jennings also made a notable appearance at the draft. He had initially decided not to attend the draft and preferred to be at a family function during the draft. After he was drafted by the Bucks, he left the family function and headed to Madison Square Garden. He later came out on stage after the 14th pick was announced to have his picture taken with NBA commissioner David Stern, just like all drafted players who attend the draft. During Jennings's NBA regular season debut on October 30, 2009, against the Philadelphia 76ers, Jennings recorded 17 points, 9 rebounds, 9 assists, and hit 2 three-point shots, and played 34 minutes. In his second game, on October 31, 2009, against the Detroit Pistons, also the debut in Bradley Center, Jennings scored 16 points during the third quarter and a team-high 24 points for the game to lead the Milwaukee Bucks to their first victory of the 2009–10 regular season. On November 14, 2009, after a scoreless first quarter, Jennings scored 29 points in the 3rd quarter against Golden State en route to a total of 55 points in the game to break the team record for most points by a rookie previously set by Kareem Abdul-Jabbar in 1970. Jennings's performance was the most points scored by a rookie since Earl "The Pearl" Monroe scored 56 in 1968. He became the youngest player to ever score 55, collecting the second-highest total for a player under 21, behind only LeBron James's 56 points in March 2005, and the second-most points scored by a Milwaukee Buck (behind Michael Redd's 57 in 2006). On February 2, 2010, he was selected to compete in the Skills Challenge. On October 30, 2010, Jennings recorded his first ever triple double, with 20 points, 10 rebounds, and 10 assists against the Charlotte Bobcats. On December 15, 2010, Jennings broke his left foot against the San Antonio Spurs when he came down awkwardly on his ankle. Despite the injury, he played 30 minutes the following game against the Jazz. The team later confirmed that Jennings would miss the next four to six weeks as he recovered from surgery to repair a fracture in his left foot. He had been averaging 18.7 points per game before the injury. Jennings missed a total of 19 games with the injury before returning on January 29, 2011 in a 91–81 home victory over the New Jersey Nets. He scored a season-high 37 points against the New York Knicks on March 25, 2011. The Bucks, however, missed the playoffs. During the 2011–12 season, Jennings played and started in all of the 66 games of the lockout-shortened NBA season. He recorded career highs in minutes per game (35.3), steals per game (1.6), field goal percentage (.418) and points per game (19.1). Jennings tied his personal record for blocks per game (.3) which he recorded in the last season. The Bucks again missed the NBA playoffs. Prior to the season, despite multiple players from his draft class receiving contract extensions, including Blake Griffin and James Harden, the Bucks chose not to extend Jennings' contract, making him a restricted free agent at the end of the 2012–13 season. 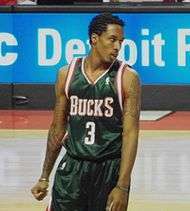 During the Bucks home opener against the Cleveland Cavaliers, Jennings made a game-winning three at the buzzer to win the game for the Bucks. Jennings teamed up with Monta Ellis, who was acquired at the 2012 trade deadline, to lead the Bucks back to the playoffs for the first time since his rookie season. On July 31, 2013, Jennings was signed-and-traded to the Detroit Pistons in exchange for Brandon Knight, Khris Middleton and Viacheslav Kravtsov. On January 11, 2014, in a game against the Phoenix Suns, Jennings recorded 16 assists in the first half, tying Isiah Thomas' franchise record for the most assists in a half. On January 16, 2015, Jennings scored a season-high 37 points on 10-of-23 shooting in the 98-96 win over the Indiana Pacers. Five days later, he recorded 24 points and a career-high 21 assists in the 128–118 win over the Orlando Magic, becoming the first player to record a 20-point, 20-assist game in the NBA since Steve Nash in 2009. On January 25, 2015, Jennings was ruled out for the rest of the season due to a ruptured left Achilles tendon that required surgery. On the season, he averaged 15.4 points, 6.6 assists and 1.1 steals in 41 games. On December 17, 2015, Jennings voluntarily reported to the Grand Rapids Drive, the Pistons' D-League affiliate, on a rehab assignment. In his debut with the Drive on December 19, Jennings recorded a double-double with 11 points and 12 assists in 27 minutes against the Iowa Energy. He was recalled by the Pistons the next day. On December 29, Jennings made his first appearance of the season for the Pistons, scoring seven points and adding four assists in 16 minutes off the bench against the New York Knicks. He had a season-best game in his fourth game back from injury, recording 17 points and 6 assists off the bench on January 4 in a 115–89 win over the Orlando Magic. On February 16, 2016, Jennings was traded to the Orlando Magic, along with Ersan İlyasova, in exchange for Tobias Harris. The next day, he made his debut with the Magic in a 110–104 win over the Dallas Mavericks, recording 18 points, three rebounds and four assists in 25 minutes. On July 8, 2016, Jennings signed with the New York Knicks. He made his debut for the Knicks in the team's season opener on October 25 against the Cleveland Cavaliers. In 21 minutes off the bench, he recorded seven points, three rebounds and five assists in a 117–88 loss. After the 2009 L'Aquila earthquake, while he was playing in Italy in April 2009, Jennings donated $50,000 to support victims. Jennings participated in Steve Nash's Showdown in Chinatown charity soccer match in New York City on June 24, 2010. Jennings, specifically his relationship with Milwaukee coach Scott Skiles, was the subject of the song "Chartjunk" by indie rock band Stephen Malkmus and the Jicks in 2014. ↑ Thamel, Pete (October 4, 2008). "Family Keeps Teenage Pro Grounded". NYTimes.com. Retrieved October 4, 2008. ↑ "Individual Records". oakhillhoops.com. Retrieved October 16, 2016. ↑ Halley, Jim (May 2, 2008). "Super 25: Lincoln (N.Y.) climbs three spots with state title". USA Today. Retrieved May 2, 2008. ↑ "Scout.com: Men's Basketball Recruiting". Scouthoops.scout.com. Archived from the original on July 19, 2014. Retrieved May 21, 2011. ↑ Lawlor, Christopher (August 29, 2007). "No. 1 prospect Jennings won't rest after successful summer". ESPN.com. Retrieved May 21, 2011. ↑ "Yahoo Sports: Rivals.com Ranking – Rivals150 for class of 2008". Rivals.yahoo.com. Retrieved May 21, 2011. ↑ Pascoe, Bruce (April 24, 2007). "Jennings took long route to Arizona". Arizona Daily Star. Retrieved December 5, 2007. ↑ Zagoria, Adam (November 9, 2007). "The best high school guards in America". SLAMOnline.com. SLAM Magazine. Archived from the original on November 12, 2007. Retrieved December 5, 2007. ↑ Watson, Matt (September 23, 2008). "Brandon Jennings Signs With Under Armour". NBA.Fanhouse.com. Archived from the original on December 16, 2009. Retrieved September 23, 2008. ↑ Rhoden, William C. (June 23, 2008). "Old World Lesson for the New N.B.A.". The New York Times. Retrieved June 23, 2008. ↑ Katz, Andy (July 17, 2008). "Jennings goes pro, signs with Pallacanestro Virtus Roma". ESPN. Retrieved July 17, 2008. ↑ Broussard, Chris (May 19, 2009). "Exchange Student". ESPN. Retrieved May 19, 2009. ↑ "Around the Globe: Brandon Jennings and Josh Childress Debut". InterBasket.net. October 15, 2008. Retrieved October 15, 2008. ↑ "Brandon Jennings Italian League profile and stats". Legabasket.it. Retrieved June 26, 2009. ↑ "Euroleague.net Brandon Jennings Official Player Profile". Euroleague.net. Retrieved June 26, 2009. ↑ "Brandon Jennings's Late Arrival to the Draft". SlamOnline.com. June 26, 2009. Retrieved June 26, 2009. ↑ "Jennings drops career-high 55 on slumping Warriors as Bucks hold on". ESPN. November 14, 2009. Retrieved November 15, 2009. ↑ "Who is the NBA's most "skilled" player?". UPROXX.com. February 3, 2010. Retrieved February 3, 2010. ↑ "Brandon Jennings out with broken foot". ESPN. December 21, 2010. Retrieved December 21, 2010. ↑ Fly, Colin (December 20, 2010). "Bucks PG Jennings out 4-6 weeks with broken foot". Yahoo.com. Archived from the original on December 28, 2010. Retrieved December 20, 2010. ↑ "Brandon Jennings scores 2 in return as Bucks earn 3rd win in row". ESPN. January 29, 2011. Retrieved January 29, 2011. ↑ "Brandon Jennings drops 37 as Bucks hand Knicks 5th straight loss". ESPN. March 25, 2011. Retrieved March 25, 2011. ↑ Thomsen, Ian (November 8, 2012). "Amid uncertainty, Milwaukee and Jennings find a common ground". SportsIllustrated.CNN.com. Archived from the original on October 29, 2013. Retrieved November 8, 2012. ↑ Middlehurst-Schwartz, Michael (November 3, 2012). "Bucks' Brandon Jennings hits game-winning buzzer-beater". USAToday.com. Retrieved November 3, 2012. ↑ "Pistons complete trade with Bucks for Jennings". NBA.com. Turner Sports Interactive, Inc. July 31, 2013. Retrieved August 2, 2013. ↑ Mayo, David (January 11, 2014). "Josh Smith's game-winner propels Detroit Pistons to 110-108 victory over Phoenix Suns". MLive.com. Retrieved January 11, 2014. ↑ "Tip-in with less than second sends Pistons over Pacers 98-96". NBA.com. Turner Sports Interactive, Inc. January 16, 2015. Retrieved January 16, 2015. ↑ Langlois, Keith (January 21, 2015). "Jennings' 20-20 vision carries Pistons to 128-point outburst, win over Magic". NBA.com. Turner Sports Interactive, Inc. Retrieved January 21, 2015. ↑ "Pistons' Brandon Jennings has surgery on ruptured Achilles". FOXSports.com. January 28, 2015. Retrieved January 28, 2015. ↑ "Detroit Pistons Medical Update On Brandon Jennings". NBA.com. Turner Sports Interactive, Inc. January 25, 2015. Retrieved January 25, 2015. 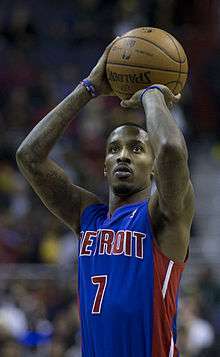 ↑ "Detroit Pistons Guard Brandon Jennings Assigned to Grand Rapids Drive of NBA D-League". OurSportsCentral.com. December 17, 2015. Retrieved December 17, 2015. ↑ Langlois, Keith (December 17, 2015). "Jennings' D-League return a testament to his passion, Gores' commitment". NBA.com. Turner Sports Interactive, Inc. Retrieved December 17, 2015. ↑ "Brandon Jennings Returns from Injury in Rehab Game with Grand Rapids Drive". NBA.com. Turner Sports Interactive, Inc. December 19, 2015. Retrieved December 19, 2015. ↑ "Pistons recall Brandon Jennings from D-League". InsideHoops.com. December 20, 2015. Retrieved December 20, 2015. ↑ "Anthony leads Knicks to 108-96 win over Pistons". NBA.com. December 29, 2015. Retrieved December 29, 2015. ↑ "Pistons pour it on late in 115-89 rout of Magic". NBA.com. January 4, 2016. Retrieved January 4, 2016. ↑ "Magic Acquire Jennings and Ilyasova From Pistons in Exchange for Harris". NBA.com. Turner Sports Interactive, Inc. February 16, 2016. Retrieved February 16, 2016. ↑ "Mavs set franchise best for 3s but lose to Magic in OT". NBA.com. Turner Sports Interactive, Inc. February 19, 2016. Retrieved February 19, 2016. ↑ "Knicks Sign Three Free Agents". NBA.com. July 8, 2016. Retrieved July 8, 2016. ↑ "James has triple-double as Cavs rout Knicks 117-88 in opener". ESPN.com. October 25, 2016. Retrieved October 25, 2016. ↑ Salazar-Moreno, Quibian (April 20, 2009). "NBA-Prospect Brandon Jennings Drops $50k to Earthquake Victims". Archived from the original on June 23, 2013. Retrieved July 12, 2009. ↑ Abbott, Henry (June 24, 2010). "Video: Steve Nash's charity soccer game". ESPN.com. Retrieved July 31, 2013. ↑ "STEPHEN MALKMUS TELLS IT SLANT". NewYorker.com. January 23, 2014. Retrieved July 31, 2016.